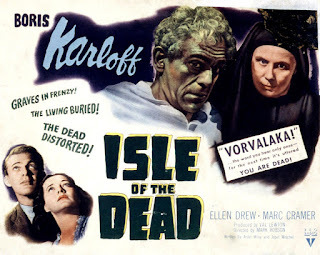 Val Lewton’s second of three horror films to star Boris Karloff was Isle of the Dead (1945) which, as you recall from my earlier review of The Body Snatcher, had begun production to actually precede that release but had to be shut down and the order reversed after one week due to the chronic pain Karloff had been suffering since House of Frankenstein. After a month’s ordered rest following a spinal fusion operation, he had shot The Body Snatcher and resumed work on this gloomy yet compelling piece. Stephen Jacobs’ biography highlights that Lewton had lost confidence in Isle of the Dead during the down-time. He confided in his family by letter during filming that it was “a complete mess” and had so little faith in the finished product that he chose to release The Body Snatcher first, feeling it to be the better of the two, which seems overly harsh self-criticism in light of the qualities on offer. Isle of the Dead certainly began life invested with a lot of personal resonance for Lewton like many of his films. He based it on the haunting painting of the same name by Arnold Böcklin in 1880 that was in the home of his aunt, the actress Alla Nazimova. As a symbolist painter, Böcklin’s description of it as a ‘dream picture’ was the closest he came to explaining its meaning - the eventual title being ascribed to it by art dealer Fritz Gurlitt. The image shows a boat arrived at a barren and forebidding island of cypress trees shrouded in shadows. Next to the oarsman he has what looks like a white coffin on board. 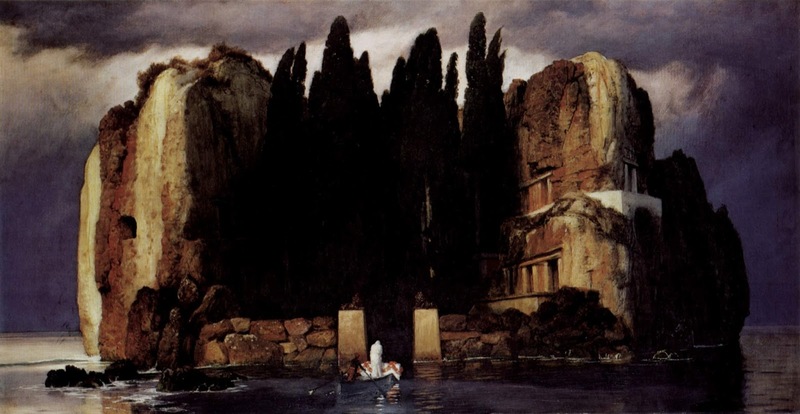 Böcklin created at least five versions of the painting, possibly inspired by the Greek island of Pontikonisi, between 1880-85, so the image clearly had a hold on him as well. Aside from its dark depths reminiscent of Lewton’s work, it’s easy to see how the purpose of the casket’s journey here would invite all kinds of story possibilities to an imaginative young mind. The script Lewton commissioned as the eighth of his nine-film tenure for RKO was credited to Ardel Wray, then as was the custom ultimately given a final draft by Lewton himself. The director was Mark Robson, in charge of his fourth consecutive film for the producer. Even before the movie is underway though, we are introduced to evidence of Lewton’s imprint on proceedings, an eternal preoccupation with death and the classical realm. Text on screen describes the Greek superstition surrounding the Vorvolaka, an ancient force of life-draining vengeance that will figure heavily despite the Twentieth Century setting. 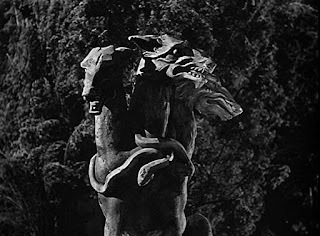 There is also a stone image (repeated at the end for emphasis) of the three-headed dog Cerberus who fiercely prevented the dead from leaving the ancient Underworld of mythology. Clearly the supernatural will figure unnervingly in what is to unfold. Set against the backdrop of the First Balkan War of 1912-1913, the story concerns Greek General Pherides (Karloff, equipped with a permed wig for a more Mediterranean look), who has earned the nickname of ‘The Watchdog’ by his brutal, indeed terminal, methods of dealing with troop discipline. He also possesses a cruel shrewdness bordering on psychopathy about how to manipulate them: “Horses cannot understand why they have to work beyond endurance” Pherides takes a row-boat out to a remote island accompanied by U.S. reporter Oliver Davis, a solid if stiff Marc Cramer, to lay flowers at the grave of Pherides’ dead wife. Their timing could not be worse as their arrival coincides with a virulent plague sweeping the island, forcing them to be quarantined in the home of Hugo Albrecht and his guests. Albrecht is a retired Swiss archaeologist, a kindly turn by Jason Robards, father to the even more illustrious screen actor son of the same name (and only referred to as ‘Sr’ some years later when his son’s career also took off). 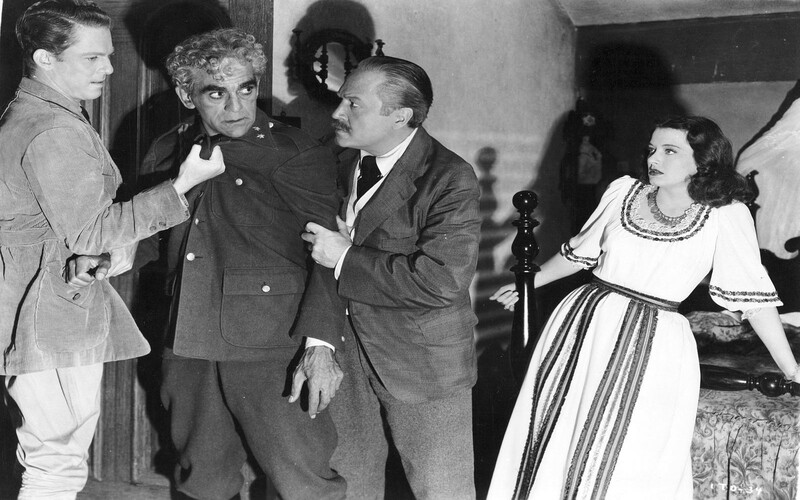 He appeared next in Lewton’s final RKO picture Bedlam (1946) - again with Karloff. Albrecht already has a busy household, comprising also his housekeeper, the black-clad doomsayer Madame Kira (a suitably funereal Helene Thimig) and a group of guests. Alan Napier imports top-drawer charm as British diplomat Mr St. Aubyn along with his invalid wife Mary (Katherine Emery) and her companion-carer Thea (Ellen Drew) - as well as another cameo from the intriguingly eccentric Skelton Knaggs who brings his peculiar creepy energy seen fleetingly in 1943’s The Ghost Ship as well as House of Dracula (1945). The contagion lockdown of the house becomes another instance of Pherides’ iron will attempting to dominate those around him. Meanwhile he is seduced by Madame Kira’s insistence that Thea is the embodiment of the evil Vorvolaka spirit, sucking the essence from Mary amidst the plague’s swathe. 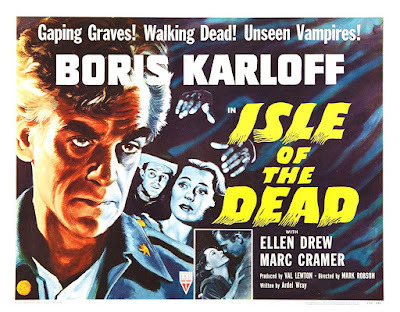 Karloff simmers with a dark brooding that made him a perfect fit for Lewton’s films, alternating between cruel fixation upon Thea and a kind of gallows humour. The tension between he and Mary’s companion is mutual though – she harbours a racial grudge over his army’s bloodshed in extorting taxes from her village years before. For her, there is a morality that runs deeper than the unfeeling decisions of government: “Laws can be wrong and laws can be cruel. And the people who live only by the law are both wrong and cruel”. 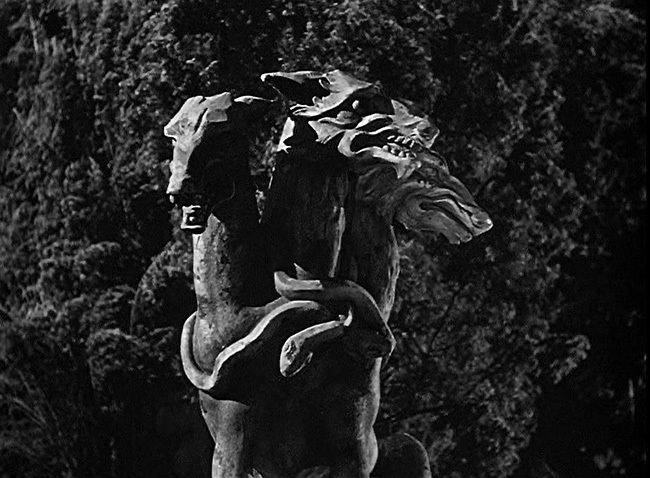 She unwittingly signals that for a man like Pherides, cold inflexibility could well be his downfall. Another of the satisfying themes woven into Isle of the Dead is the classic conflict between the comfort of old religious beliefs and the sweeping changes wrought by the modern world. Pherides sees himself as a product of the thrusting new military of Greece; Dr Drossus (the venerable Ernst Deutsch) places his faith in pioneering medicine; conversely Albrecht quietly prays for relief to the Greek gods such as Hermes in his little temple. As the cast begin to die off, the soon ailing Drossos is moved by the old islanders’ ways into finally acknowledging “They are more powerful than my science” before he falls victim. Even Pherides briefly questions his own nature in a contemplative discussion with Davis, but not enough to dissuade him from declaring that he will kill Thea, much to Davis’s revulsion as her emerging lover. For many actors, his vow “When I am sure, I will destroy her” would be a melodramatic landmine, yet Karloff states it with a credible finality rather than histrionics. After Mary succumbs to the plague, she is pronounced dead and entombed. We then learn that she had only undergone one of the cataleptic trances she warned the doctor she was prone to, thus leading to an unforgettably chilling resurrection sequence. Robson and cinematographer Jack Mackenzie combine with hugely effective sound design from Jean L. Speak and James G. Stewart to realise the mounting dread of echoing water droplets and a finely-rendered extended creaking of the makeshift coffin lid as she prizes it open. (An added frisson is the remembrance of her persistent fear of premature burial.) The effect is made even more potent by being partly presented off-camera and reacted to in suppressed terror by Pherides and Kira. The tragic foreshadowing of Pherides’s hell-bent pursuit of Thea comes to awful fruition when Mary goes on a homicidal stalking spree, looming out of the shadows to fatally stab Kira and then the now plague-fogged, delirious Pherides himself before he can get to his prey. The screenplay makes an unexpectedly poignant twist of his dying words: “She came out of the darkness. She must be destroyed” he gasps as he expires, leading Albrecht and the others to possibly conclude that his own insane mission was ultimately heroism. You may have noticed I don’t normally quote contemporary newspaper reviews here, preferring to leave that to more august colleagues, but I can’t help feeling that the New York Times, in saying Karloff “stumbles through the picture with a vacant, tired state”, may have misread his character choices as a real comment on the picture. His is a textured portrayal, heavily weighed down by the ghosts of past crimes that he vainly tries to block out with a new and terrible purpose. And like all of Val Lewton’s RKO movies, it lingers in the mind and makes a strange compelling poetry out of meditating on death and the fragility of life.